After all, you can buy various foods from the vendors all over Azeroth and Northrend. The foods will heal you up by some amount over 30 seconds or so. Since they’re so readily available why bother with cooking? Some recipes are selling for very high prices. Grab them from a vendor and check prices on the AH. You may be shocked. Buying and reselling recipes is a great way for lower level characters to make some pretty good gold. Foods that provide buffs, or the raw ingredients to certain foods, also command high prices. Clam meat, for example, is way up there at times. Check prices for the ingredients, check WoWhead.com for what drops that ingredient, then go farming. Like any other skill you will still need to train up at the appropriate skill levels. All (previous) Cooking awards have been combined into a single currency: Epicureans Awards. This not only cleans up your currency list a bit, but means that doing the daily quests in Stormwind can help you buy the Chef’s Hat in Dalaran. For the Mists of Pandaria there is a new cooking token, the Ironpaw token. You gain those by doing various quests and you use them for ingredients and some perks. Also, there are now six specializations to lean, in addition to the main cooking skill. Unlike other professions that have, or have had, specializations you can learn all six at the same time. Keep in mind that this means when you’re leveling cooking you will need to gain 600 skill in each specialization to be a master chef. If you’re able to get to Halfhill Marketplace (whatever your level) and have no cooking skill to speak of, seek out Sungshin. She’ll be able to train you all the way up and will inmtroduce you to the specialist cooks. 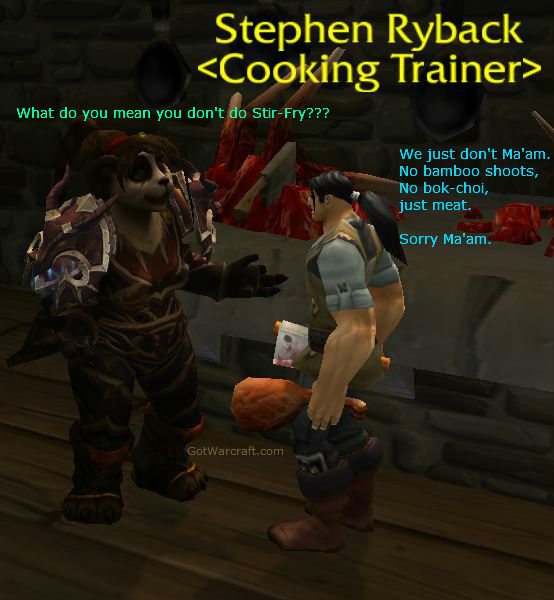 You can see details and recipes on our Pandaria Cooking page. Note that 525-600 is on the other page. There is some overlap in the recipes skill ranges, below. This will give you some options if ingredients for one recipe or the other are not available. Note: The recipe for Kungaloosh is obtained at the end of a quest chain. 450-525: Beyond this point every recipe is purchased using Chef’s Awards from earned from the daily cooking quests provided by the quest giver in Stormwind or Orgrimmar. Hand the awards in to the Sous Chef next to the quest giver. With Mists of Pandaria, the awards from the daily cooking quests can be used at any recipe vendor. Zen Master cooking, 525-600, min level 80, 500 skill to train up. 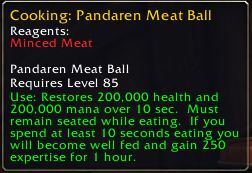 See our Mists of Pandaria Cooking page for details on how to reach 600 cooking, in each of the several spacializations. Also listed are the achievements you will earn. Congratulations on your Mastery of the Cooking skill! 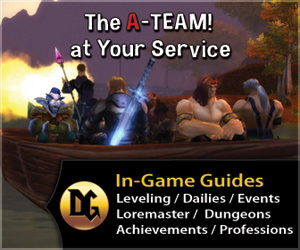 Mists of Pandaria has raised the level cap to 90. Be ready and cruise through the new content with Dugi. You’ll never have any doubts as to where to go or what to do. Plus, you’ll be able to get all of your alts leveled quickly and easily, regardless of race or faction. Get yours here.